Andrew Hawkins on the Columbia campus. 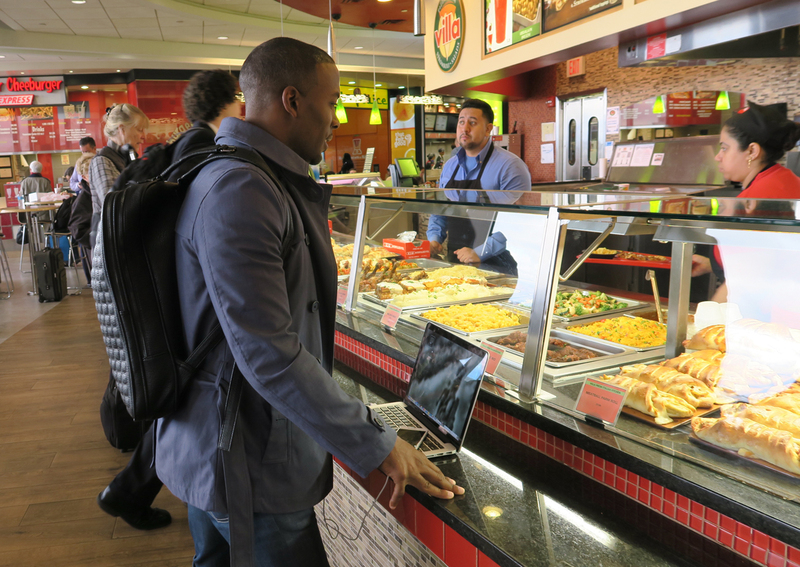 NEW YORK CITY — Weaving through throngs of travelers as he would a crowded NFL secondary, Browns receiver Andrew Hawkins balances an open laptop in one hand while frantically typing with the other. The WiFi on Hawkins’ JetBlue flight from Tampa to Newark wasn’t working, so he wasn’t able to upload his homework assignment for his graduate-level Sports Finance class before the usual noon deadline. It sounds like a modern spin on the classic dog-ate-my-homework excuse, but such is the life of an NFL player who doubles as a full-time graduate student in the offseason. In fact, offseason might not apply for the 29-year-old Hawkins. Since the whistle blew on the 2015 season, he’s been busier than ever, juggling fatherhood (three kids under the age of five), a workout program in Florida and the rigors of an Ivy League education in New York City. Every Thursday, Hawkins makes the round trip from Tampa to New York to take a full day of classes at Columbia University, where he’s enrolled in his second semester in the master’s program in sports management. 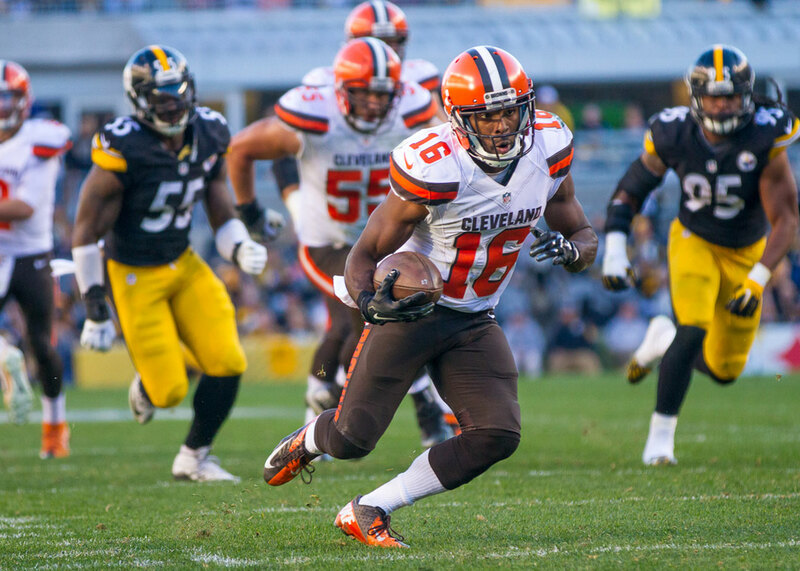 Hawkins led the Browns in receiving in 2014, but his ’15 campaign was cut short by concussions. What’s that juggling act like? The MMQB tagged along with Hawkins on a recent Thursday to experience his crazy schedule. 5 a.m. The 20-hour day begins as Hawkins squeezes in an hour-and-a-half workout before heading to the airport. 9:28 a.m. Hawkins takes the same JetBlue flight to Newark each week. On board, he usually finishes up classwork and listens to Kanye through a kid-sized pair of yellow Despicable Me Minion headphones, a lucky token from his four-year-old son, Austin. “He thinks they’ll keep me safe,” Hawkins says. Even though dad will be back from school later tonight, Austin hates Thursdays. Scheduling the Columbia courses back-to-back-to-back means Hawkins misses only a day a week with the family—wife Markisha, Austin and 10-month old twin daughters Autumn and Aubree—and doesn’t have to uproot them from their winter home in Florida to face the New York winter. 12 p.m. Hawkins lands at Newark. He’s hungry, and if he doesn’t eat now, he knows he won’t make it through the marathon ahead of him—three two-hour classes in a row, the stuff of every student’s nightmare. “I didn’t even take three in row when I was in school,” Hawkins says with a laugh as he pushes his open Macbook along the buffet line next to his tray of cheese pizza and hot wings. (“I probably shouldn’t be eating this,” he says.) His black leather backpack broke this morning, he has a cold, and he still hasn’t finished his assignment. But now that he’s not hangry, the day is looking up. Fueling up for the long day ahead. Outside the airport, Hawkins grabs a cab to take him to Columbia’s campus on Manhattan’s upper west side. He rides with his computer on his lap, making calculations on a spreadsheet for the assignment due in his first class: a profit-and-loss report for a collegiate all-star lacrosse game. Hawkins has designed an event he’s called the “Crosse-Off Challenge,” a five-day lacrosse experience highlighted by an All-Star game and youth clinic. Class starts at 2:10, and before that he’s got a meeting with his academic advisors. This is crunch time. On the first day of classes this semester, students had to introduce themselves to the room, stating their name and job. When it was his turn to speak—“Andrew Hawkins, professional football player,” his classmates figured he was retired. “Everyone said, ‘Oh you used to play?’ And I said, ‘No, I play right now.’ ” A full graduate-school course load isn’t part of many active players’ offseason plans, but Hawkins knows the importance of preparing for life after football—because he’s already had to deal with it. The 5-7 slot receiver went undrafted out of Toledo in 2008 and had just one NFL tryout, with the Browns, who chose not to sign him. “I was on my way to hanging it up,” he says. With an eye to the future, he interned that year in the Detroit Lions’ personnel department and worked as recruiting analyst for Scout.com. Even before that, while at Toledo, Hawkins had interned in the sports marketing department and wrote for Rivals.com. “I was always trying to get myself ready to work in sports business,” he says. 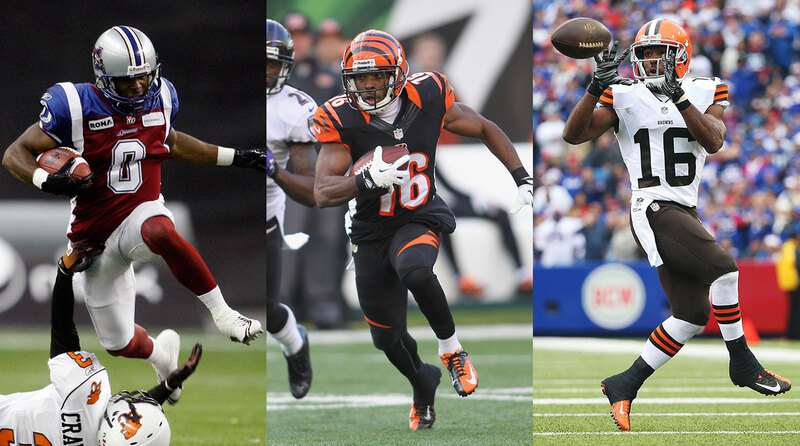 Hawkins as an Alouette, a Bengal and a Brown. He never gave up on football, though, and in December 2008 he signed with the CFL’s Montreal Alouettes. But before the Canadian season started, Hawkins competed on Michael Irvin’s Spike TV reality show, 4th and Long, the prize being a spot on the Dallas Cowboys’ training camp roster. Hawkins was a runner-up on the show, so he headed north to Montreal, where he caught on, playing two seasons and winning two Grey Cups. That spurred NFL interest—the Rams signed him in January 2011, and, after he was cut in August of that year, the Bengals picked him up off of waivers. Cincinnati added him to its active roster early in the season, and he stuck with the Bengals for three years. In 2014 the Browns offered Hawkins, then a restricted free agent, a front-loaded four-year contract worth $13.6 million. “It’s a full circle kind of feel,” he says of his second go-round with the Browns. 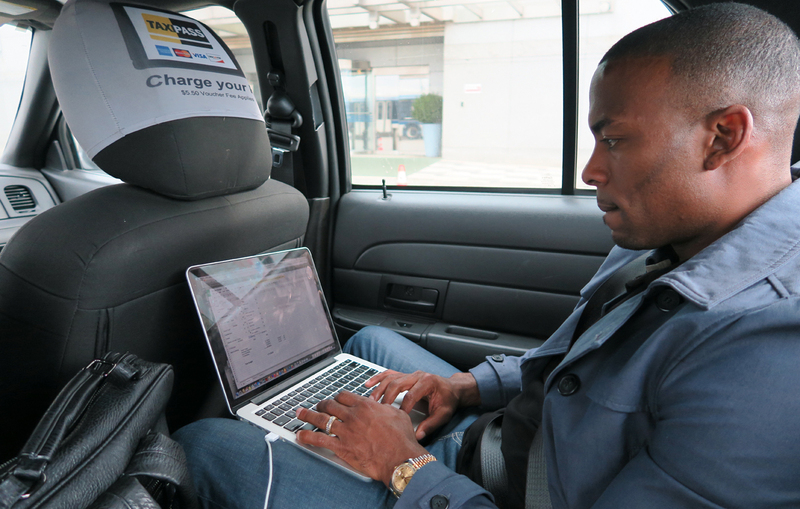 Coursework in the cab from the airport. Today his timing is perfect, and the cab pulls up at the corner of Broadway and 116th Street just in time for Hawkins to make his advisor meeting. Prone to motion sickness, Hawkins is relieved when he steps out of the cab. “The first week, after all the flying and the cab rides, I was sick for three days after I got back,” he says. The conversation then turns to planning the next year of coursework. Hawkins will take three more classes this summer and one online course during the season next fall. 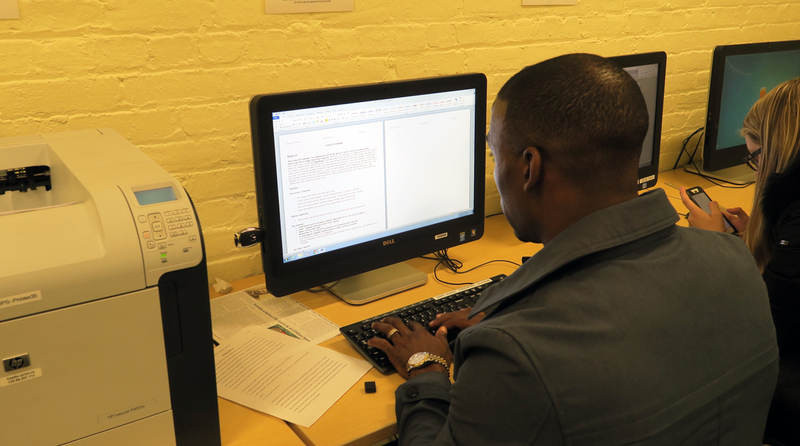 The final degree requirement is an internship or a special research project. He’s not sure yet where he’d like to intern, but if he chooses to do a special project, there’s one subject that he feels a personal responsibility to research: concussions in football. 2:05 p.m. Hawkins rushes out of Spizzirro’s office into a stuffy, windowless student lounge in the basement of Lewisohn Hall and takes a seat at a desktop computer to print out his “Crosse-Off Challenge” Sports Finance assignment. He grabs the copy from the printer, looks it over, crumples it up and throws it away. Not good enough. He adds another sentence to the section on marketing strategy. There’s just three minutes remaining before class starts. Is this the sign of a perfectionist or a procrastinator? “Definitely a perfectionist,” says Hawkins. Putting the final touches to the week’s homework. 2:10 p.m. Sports Finance. A couple minutes late, Hawkins tiptoes into class and hands his assignment to the T.A. He takes a seat in the front row for Professor Ray Katz’ Sports Finance class. Katz, managing partner at ROI Sports Marketing Group, values class participation, determined by a scoring system on a scale of one to five points: one point for a stupid question or comment, five points for a contribution no one else thought of. Hawkins doesn’t have a five-pointer today, but he’s had several in previous weeks. Katz’s class is one of the reasons Hawkins chose Columbia. A marketing major as an undergrad, he knew he needed a finance-heavy curriculum to prepare himself for a front-office role. 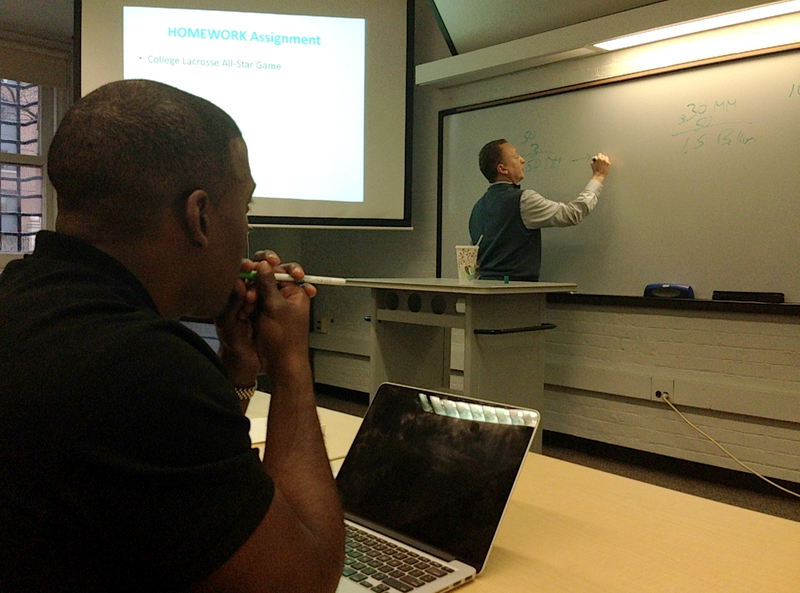 Hawkins took corporate finance as an online course during the NFL season. “It was brutal,” he says. Most of the other students in the program are continuing-education types like Hawkins. One of his classmates works for MLB, another for Roc Nation, another for the NBA. Columbia’s graduate sports management program is ranked third globally, and many of the students are international. 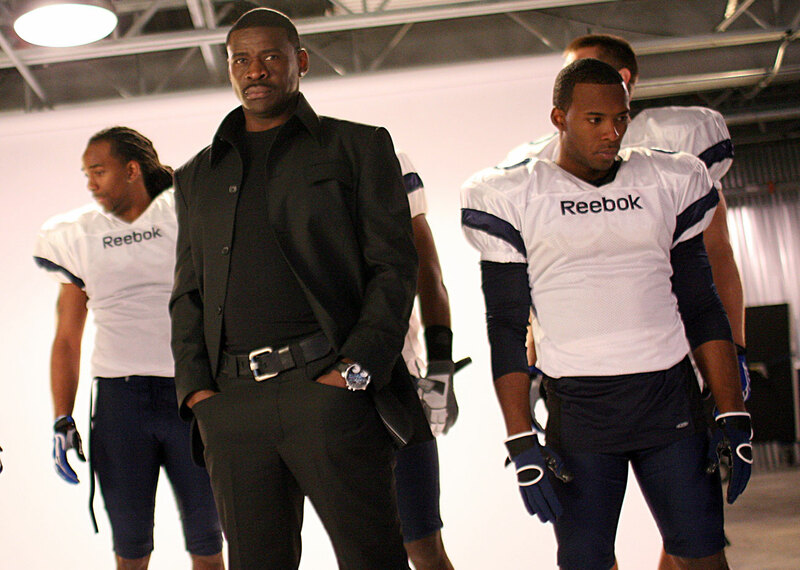 Hawkins (right) got a shot at the NFL in Michael Irvin’s 2009 reality show. Katz, at the board, is impressed by Hawkins’ commitment and academic ability. The class begins with discussion of the homework. Hawkins suggests raising the price-point for participants in a lacrosse event in comparison to football, because parents of lacrosse players have one of the highest median incomes in youth sports. “Because they’re generally more affluent, they would more than likely be willing to spend more,” he says. Katz nods in agreement. It’s not quite a five-pointer, but it’s close. 4:10 p.m. Leadership and Management. On the way to his second class, Hawkins makes a quick stop at a student lounge to fuel up. He grabs a plate of lasagna and a Mountain Dew for a much-needed energy jolt. He needs to be extra-alert for the next class, because Professor Neal Pilson tends call on students without warning. Hawkins fits three classes into a six-hour window on Thursdays. Pilson’s Leadership and Management course is a study of skills that make great leaders. 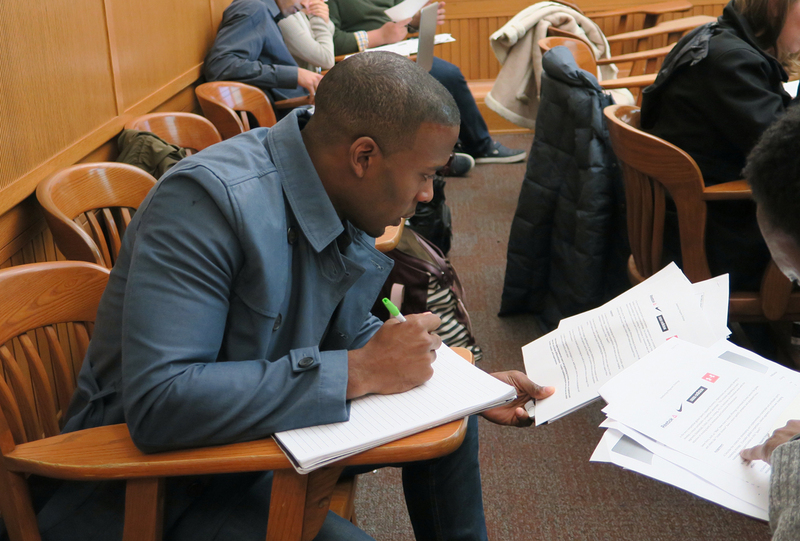 The former president of CBS sports, Pilson is trying something new in today’s class: a crisis decision-making simulation. Pilson has concocted three scenarios and will select students to role-play how they would work through the crisis together. Hawkins is chosen to play the role of a university president of a northeastern college that has been invited to join the Big 12 conference for football only. The school has 72 hours to decide whether to make the move. Hawkins leads a discussion with students who play the athletic director, a booster, the football coach and legal counsel. As a group, they weigh the cost and benefits of joining the Big 12. Hawkins closes out the simulation by telling each member of the group what they need to do next—“the next steps” that Pilson preaches are essential to end every meeting. 6:10 p.m. Advanced Sports Media and Marketing. 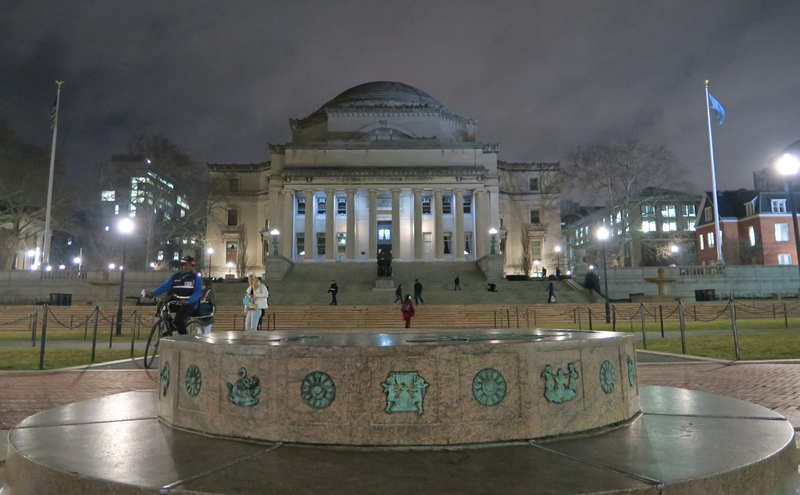 It’s dark out now, and Columbia’s campus is lit up in the night. “I really need to take a campus tour,” Hawkins says as he walks past the massive colonnade of Butler Library. But he still hasn’t found time to pick up his student ID, let alone explore the campus. Hawkins climbs the stairs of Hamilton Hall and can’t remember which floor his class is on. The fourth? Fifth? It’s been a long day. Columbia at night. Hawkins hasn’t had time for a tour—or even to get his student ID. Advanced Sports Media and Marketing, also taught by Katz, is the day’s last class, and possibly the most challenging. Today’s session focuses on TV viewership and how brands choose the channels and events on which to place their ads, by calculating the comparative sizes and demographics of the audience. GRP, CPP, HUT—Katz throws around abbreviations and acronyms and moves quickly through math formulas, but Hawkins keeps up with the fast pace, asking questions on the value of TV ratings impressions. 7:50 p.m. While finishing an in-class assignment to analyze league and team sponsorships for Under Armour, Hawkins takes out his phone to schedule an Uber pickup. He silently grabs his backpack and, with a nod to Katz, cuts out of class a few minutes early to head to JFK for his 9:30 flight. He’s never missed his plane before, but there have been some pretty close calls. This is another one—he makes it with minutes to spare. Questions or comment? Email us at talkback@themmqb.com.